Custom elements can offer the same general benefits of React components without being tied to a specific framework implementation. A custom element gives us a new HTML tag that we can programmatically control through a native browser API. GitHub is using custom elements for their modal dialogs, autocomplete and display time. YouTube's new web app is built with Polymer and web components. So, let's build a tiny application that lists details about a GitHub repository. See the Pen React Demo - GitHub by Charles (@charliewilco) on CodePen. To break this down further, we have a component that has its own state, which is the repo details. Initially, we set it to be null because we don't have any of that data yet, so we'll have a loading indicator while the data is fetched. During the React lifecycle, we'll use fetch to go get the data from GitHub, set up the card, and trigger a re-render with setState() after we get the data back. All of these different states the UI takes are represented in the render() method. Doing this with custom elements is a little different. Like the React component, our custom element will take a single attribute — again, the name of the repository — and manage its own state. See the Pen Custom Elements Demo - GitHub by Charles (@charliewilco) on CodePen. To start, all we need to do to define and register a custom element is create a class that extends the HTMLElement class and then register the name of the element with customElements.define(). This new element isn't very useful, but with custom elements, we get three methods to expand the functionality of this element. These are almost analogous to React’s lifecycle methods for their Component API. The two lifecycle-like methods most relevant to us are the disconnectedCallBack and the connectedCallback and since this is a class, it comes with a constructor. constructor An instance of the element is created or upgraded. Useful for initializing state, settings up event listeners, or creating Shadow DOM. See the spec for restrictions on what you can do in the constructor. disconnectedCallback When the element is removed from the DOM. Useful for running clean-up code. By calling super() in our constructor, the context of this is the element itself and all the DOM manipulation APIs can be used. 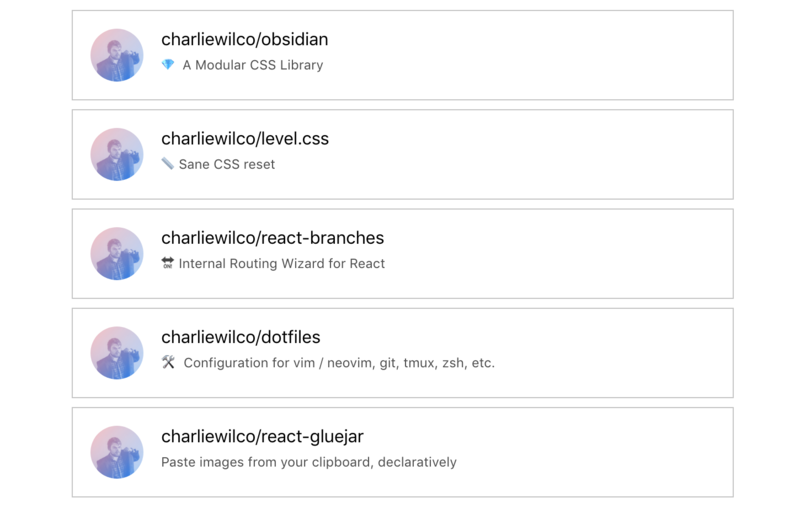 So far, we've set the default repository details to null, gotten the repo name from element's attribute, created an endpoint to call so we don't have to define it later and, most importantly, set the initial HTML to be a loading indicator. Now, let's add a method to this class to ask GitHub for details about the repository. Next, let's use the connectedCallback method and the Shadow DOM to use the return value from this method. Using this method will do something similar as when we called Repository.componentDidMount() in the React example. Instead, we'll override the null value we initially gave this.repoDetails — we'll use this later when we start to call the template to create the HTML. You'll notice that we're calling methods related to the Shadow DOM. Besides being a rejected title for a Marvel movie, the Shadow DOM has its own rich API worth looking into. For our purposes, though, it's going to abstract the implementation of adding innerHTML to the element. That's pretty much it. We've defined a custom element that manages its own state, fetches its own data, and reflects that state back to the user while giving us an HTML element to use in our application. After going through this exercise, I found that the only required dependency for custom elements is the browser's native APIs rather than a framework to additionally parse and execute. This makes for a more portable and reusable solution with similar APIs to the frameworks you already love and use to make your living. There are drawbacks of using this approach, of course. We're talking about various browser support issues and some lack of consistency. Plus, working with DOM manipulation APIs can be very confusing. Sometimes they are assignments. Sometimes they are functions. Sometimes those functions take a callback and sometimes they don't. If you don't believe me, take a look at adding a class to an HTML element created via document.createElement(), which is one of the top five reasons to use React. The basic implementation isn’t that complicated but it is inconsistent with other similar document methods. The real question is: does it even out in the wash? Maybe. React is still pretty good at the things it's designed to be very very good at: the virtual DOM, managing application state, encapsulation, and passing data down the tree. There's next to no incentive to use custom elements inside that framework. Custom elements, on the other hand, are simply available by virtue of building an application for the browser. And this video, https://www.youtube.com/playlist?list=PLJQupiji7J5cAv7Jfr1V8FvUTx_jJrmCl , to see it in action. Did you try StencilJs? What do you think about it? i didn’t. i mostly stick with react. looks interesting though!